Melt's owner said the city suggested the 3D signage. While the new location captures the original restaurant’s menu and atmosphere with similar hardwood floors, a blue tin ceiling and stained glass, it’s much larger than its sister spot. Fish said his goal for the East side location is to “alleviate the wait issue.” With that in mind, the 1,200-square-foot kitchen is nearly three times the size of Lakewood’s. The total restaurant space can accommodate 170 guests and is just shy of 5,000 square feet, compared to Lakewood’s 3,600. In addition, the horseshoe bar, which seats 70 and features 30 beers on tap, will be first come, first served, while Lakewood’s bar has space for only 16. Fish said he is also considering accepting reservations for a large table in the front of the restaurant that seats 15 to 20. When not reserved, Fish said it can function as a “commuter” table so different parties can share the space and eat together. Many of the materials used in the rebuilding of the interior space have local origins. For example, the wood used in the bar is from southern Ohio, and the reclaimed pews and stained glass came from churches in Lakewood and Toledo. Late this summer, a to-be-constructed outdoor patio with a privacy fence, vegetable garden and bar might seat an additional 40 guests. 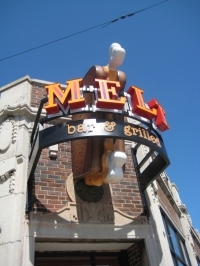 Fish said the City was “very supportive” of Melt’s eclectic personality and actually suggested the 3D signage. In addition, local artist John G. created the East Side Invasion comic posters in Melt’s windows and will continue to do original art for both locations. According to Fish, approximately 200 parking spots behind the building and across the street will accommodate Melt diners. Fish said he expects to hire about 55 staff for the restaurant. More than 500 applicants showed up to apply during Melt's two-day job fair in April. Melt will be open seven days a week and will feature brunch on Sundays. Fans can join the Big Cheese Club, at www.meltbarandgrilled.com for updates on the new location, employment opportunities and monthly sandwich specials. Per her grandmother, Christina Klenotic is a “good eater” who never met a carb she didn’t like. She enjoys sampling eclectic restaurants, galleries and neighborhoods, which is why she loves Cleveland Heights.